The Meadows at Interwood is a Class A suburban office building featuring cantilevered office areas overlooking a dramatic four story landscaped atrium lobby. 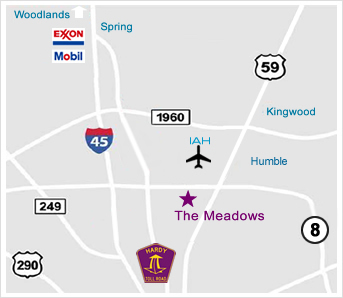 The property is located just off Beltway 8, between JFK Blvd and US 59 and minutes south of Houston’s George Bush Intercontinental Airport. The building is in the Interwood Corporate Park development, a densely wooded 415 acre oasis including a 1-1/4 mile jogging trail and 17 varieties of native Texas trees. A complimentary fitness center is located in the building with advanced exercise equipment and state-of-the art shower and locker room facilities.